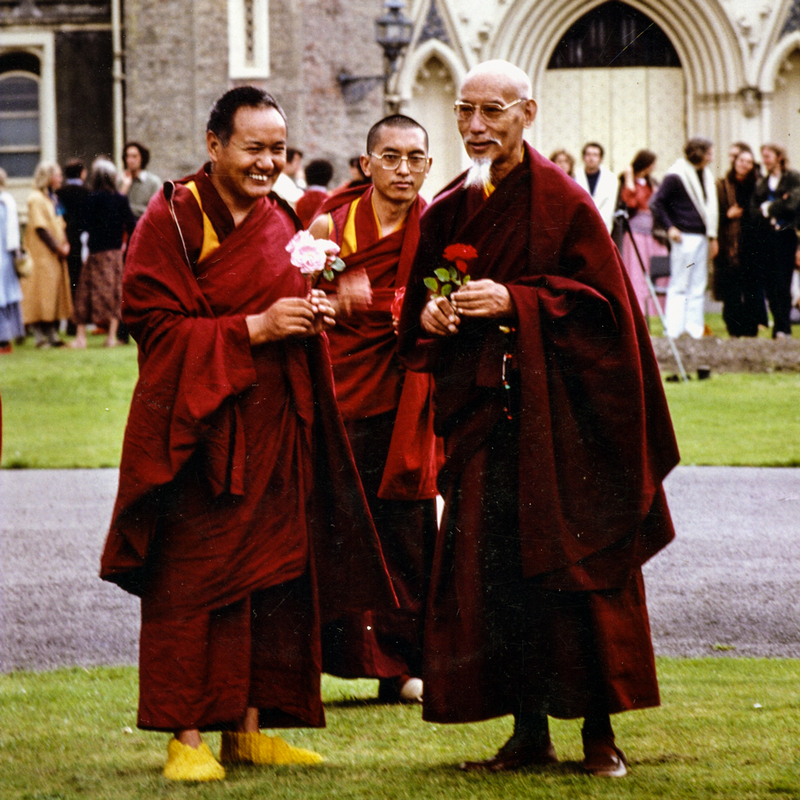 Lama Yeshe, Lama Zopa Rinpoche, and Zong Rinpoche at Manjushri Institute, UK, 1978. Photo courtesy of Lama Yeshe Wisdom Archive. Lama Yeshe was kinder than all the three times’ buddhas. For the tantric meditators, when you bring the wind into the central channel, the in-breath and out-breath are equalized, without one being stronger than the other. When the wind abides in the central channel the belly does not move; it stays calm. There’s no breathing through the nostrils during the absorption when the gross mind stops and only the most subtle mind is actualized. That meditation on emptiness is like an atomic bomb, the quickest way to cease the defilements and achieve enlightenment. That becomes the direct cause of the dharmakaya. My guess is that when the mind becomes extremely subtle, when the gross mind stops, at that time the heart stops beating, there is no rising or falling of the belly and no breathing through the nose. I’m not sure; that’s just my guess. Externally, what Lama Yeshe manifested was a heart problem. That’s what people saw; that’s what the doctors diagnosed it as. Lama actually used this heart problem that outside people saw for his meditation session. Lama’s meditation sessions were often Lama lying down and people took that to be him resting or sleeping; that was the view of other people. Actually, for Lama Yeshe that was a meditation session. It was a very high tantric meditation, part of the completion stage practice, the practice of clear light and the illusory body, the direct cause of the dharmakaya and the rupakaya. He did this at night and always after lunch. To other people he was resting or sleeping, but it was actually a meditation session. Lama didn’t show much sitting in a formal meditation posture with eyes closed and so forth. He did sometimes, later, but it wasn’t normal for him. He was a very high yogi, a very accomplished master, so his way of doing this was kind of secret. That is what was happening internally. Outside, whoever he was with, he fitted in with them. If he was with children, he fitted in with them; when he was with old people he fitted in with them. Whoever came he fitted in with them, acting in a way that was best for them, in order to make everybody happy. Therefore, everybody saw Lama differently. Some people even saw him as a big businessman. But in reality he was a great meditator who had realizations of emptiness and bodhichitta. He realized emptiness while still in Tibet. He said he realized emptiness while they were debating Madhyamaka philosophy many years ago in Tibet. And I remember something happened while we were in Delhi and Lama said he could never get angry at even one sentient being, he could never renounce even one sentient being. That shows he had the realization of bodhichitta a long time ago. I pushed Lama to come to Kopan to help with the course. Usually I talked about the eight worldly dharmas and the negative attitude and the lower realms, and I’d spend about two weeks or so on that, then everybody got very depressed, by hearing all the negatives. Then Lama Yeshe came and made them laugh, releasing them from that sadness and depression. This is how we did it. 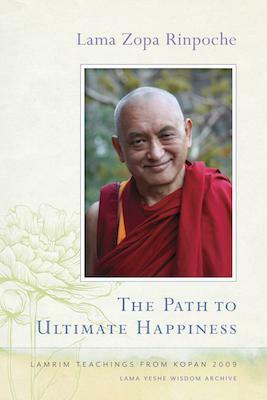 Excerpted from The Path to Ultimate Happiness, teachings given by Lama Zopa Rinpoche during the 42nd Kopan lamrim course in 2009 at Kopan Monastery, Nepal, lightly edited by Gordon McDougall and Sandra Smith. In the new ebook The Path to Ultimate Happiness, Lama Zopa Rinpoche explains the lamrim, the stages of the path to enlightenment, teaches extensively on emptiness and the good heart, and gives commentaries on sur practice, the Offering Cloud Mantra, and other prayers and practices.